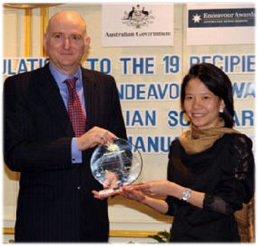 Dr. Phikunthong Kopermsub from the NanoDelivery Lab received the Australian Government Endeavour Award from H.E. Paul Grigson, Australian Ambassador to Thailand on January 21 in Bangkok. She is doing her fellowship at Flinders University. Each year the Endeavour Awards bring high achieving students, researchers and professionals from around the world to Australia for study, research or professional development in a broad range of disciplines and also enables Australians to do the same abroad.